My Root Canal Failed. Now What? This is quite a common scenario which may happen to anyone who has had a root canal on one or more teeth. As a matter of fact I see quite a few patient who present with failed root canals. Of course such failure is a big disappointment to a patient who probably paid a considerable amount of money for the root canal. When this happens the tooth may or may not be symptomatic. In either case a failed root canal is a serious problem and should be addressed immediately. Presence of very small accessory canals in the tooth that were not or could not be located and treated. Incomplete seal of the canal or canals. Root crack after root canal treatment and restoration of tooth with post and build-up. Tooth fractures due to weakening of tooth following root canal treatment. Not restoring the tooth in a timely manner following completion of root canal, resulting in bacterial leakage and secondary infection. Overall about 20% of all root canals fail. A failed root canal, if ignored can cause considerable damage to adjacent teeth and/or surrounding jaw bone. What is the treatment for a failed root canal? As mentioned earlier, a failed root canal should be addressed immediately. The treating dentist should evaluate the condition of the tooth and decide whether redoing the root canal will predictably treat the tooth. There is increasingly more consensus among dentist and endodontist in recent years that redoing a failed root canal has a much lower success rate. They agree that in majority of failed root canal cases extracting the tooth and replacing it with dental implant may be an appropriate approach. It is interesting to know that a large number of people shy away from the idea of having root canals. I have been told by many patients that root canals don’t eventually work. This belief may be due to stories they have heard from friends or relatives about their bad experiences with root canal treatments. Such patients prefer extraction of the infected tooth and replacement with dental implant. Dental implants have a success rate of 95-99%. Root canal treatments have about 80% success rate. This is definitely a determining factor in choosing between the two for both patients and dentists. 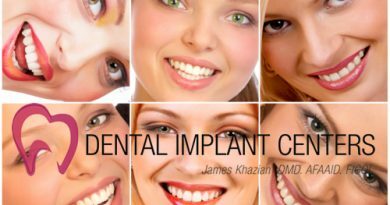 Dental Implant Centers is the leading provider of comprehensive dental implants and cosmetic dentistry treatments in southern California. Dental Implant Centers is an all in one facility where your entire dental implant treatment is done in one office and by one doctor. There is no referral to another office. This will provide a much smoother treatment process, with less confusion for patients. For more information, or to make a free consultation appointment, you may click here, or call 866-4my-smile (469-7645). We offer all implant related procedures such as: single or multiple tooth replacement, full mouth implant reconstruction, implant retained dentures (overdenture), ALL on 4, minimal or advanced bone grafting procedure. We also offer top cosmetic dentistry such as veneers, lumineers, teeth whitening, and bondings.